What is spirituality? How does it fit into Islam? Where would I learn about it? Looking at the lives and deeds of accomplished spiritual masters is very inspiring. But how can a person get from a basic practice of Islam to the states of the righteous people of the past? This course is an introduction to the basic and essential principles upon which the spiritual path is built. It covers the essentials, and builds on them, giving us a clear instruction for the path ahead. “And know that root of these problems “Is love of leadership and forgetting what is sure to come.” – Imam Ibn ʿAshir Imam ʿAbdul-Wahid ibn ʿAshir’s great work, The Helping Guide, has been highly regarded by scholars and used to teach Law, Creed, and Spirituality for hundreds of years. The work starts with an introduction to spirituality, explaining the most basic principles and moving up. Many have benefitted through the immense wisdom contained within these words. 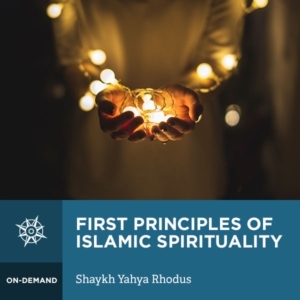 In this short course, Shaykh Yahya Rhodus brings life to this text through his clear and profound explanations. We learn that the spiritual path is one of removing faults and taking on praiseworthy qualities; the former being more important. The importance of repentance is discussed in detail, with it being a realignment to one’s destination after being taken off course by sins. We also learn about the importance of sincerity and renewing one’s intention, especially after slipping up. This course is the perfect place to start to learn about the science of inward purification, and a beautiful reminder for everyone.